Happy Friday! 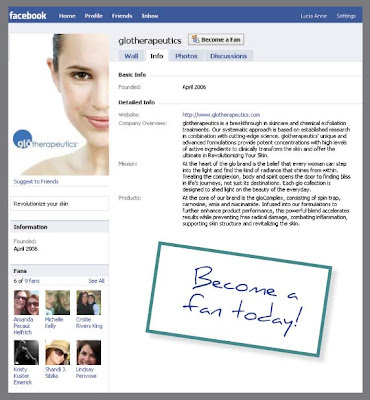 gloProfessional has great news for you all this afternoon: glotherapeutics now has a fan page on Facebook. We know this will be a great place for us to get to know all of you better and for you to get to know each other! So become a fan today and look forward to great glotherapeutics Facebook-only exclusives (check out what the glominerals facebook fanpage is up to right now!) It will also be a source for insider-information on the exciting developments with the line and a place for you to ask questions and have them answered. We can't wait to see how this community will grow! See the site here and have a safe and wonderful weekend!